This week continues International Week 2016 brought to you by International Student Council. International Week kicked off last Thursday with International Dance Night and ends this Thursday with International Night. See full schedule posted on their Facebook page. Our International Week file in the archives begins in 2002 (from RS 22/3/0/1). However, in the same record group (RS 22/3/0/1) we have a file for the International Student Council that has documents from International Week ’87. Drop by and learn about the history of International Student Council and International Week. We’re open Monday-Friday, 9-5. You can also check out our previous blog during International Week 2010 featuring our records for the Cosmopolitan Club. From “The Boulder.” Box 6, folder 6. Charles S. Gwynne Papers, RS 13/8/12. Charles S. Gwynne was a geology professor at Iowa State from 1927-1970. He used the boulder in his teaching by taking students to the rock regularly as part of class field trips. Eventually it was decided that the boulder was at risk from potential vandalism and the inevitable widening of Stange Road. Gwynne gave his unofficial blessing and it was moved to its present location by the geology students. A story on the boulder from Inside Iowa State. Click on the picture to see the preserved website via our web archives. Interested in seeing the erratic for yourself? You may want to participate in this earthcache about the boulder. 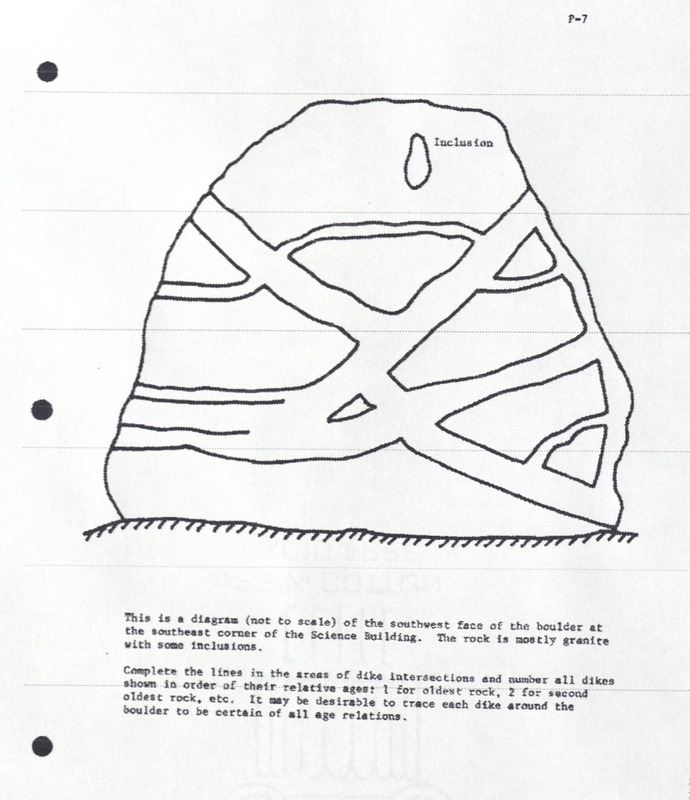 See the rest of the Gwynne papers (RS 13/8/12) for more on geology in Iowa and the midwest. Marston Water Tower, 1897, showing Morrill Hall on the right and Margaret Hall on the left. Watch the tower rise above campus in this series of construction photographs from 1897. The beginning of construction of Marston Water Tower, showing Old Main in the background, March 9, 1897. First stage of construction completed, March 18, 1897. Old Main is on the left, the Chemical and Physical Laboratory is on the right. Progress on the water tower, March 22, 1897. Construction begins on tank itself, April 22, 1897. Construction nearly completed on the water tower, July 6, 1897. When I learned about the Spanish Influenza epidemic of 1918 in grade school, a little playground rhyme from the era etched itself in my mind. It goes like this: “I had a little bird, it’s name was Enza, I opened the window and in flew Enza.” Of course, this seemingly lighthearted rhyme is a rather punny (sorry…) metaphor for the spread of influenza (“in flew Enza”). As we’re in the midst of a particularly nasty and newsworthy flu season, it seems like a good time to flash back to that flu epidemic that nearly 100 years later remains in our consciousness. Like the rest of the world, Iowa State University was not immune to the disease, and life on campus was impacted greatly. Spanish influenza began its spread in late August, 1918. Shipments of troops moving out across the world during World War I aided the transmission of the disease. By October of that year, the epidemic swept into Iowa, and the state first reported cases of influenza on October 5th. Although the first reports were submitted at that time, it seems that the disease was here a bit earlier – Camp Dodge was quarantined on September 28th. 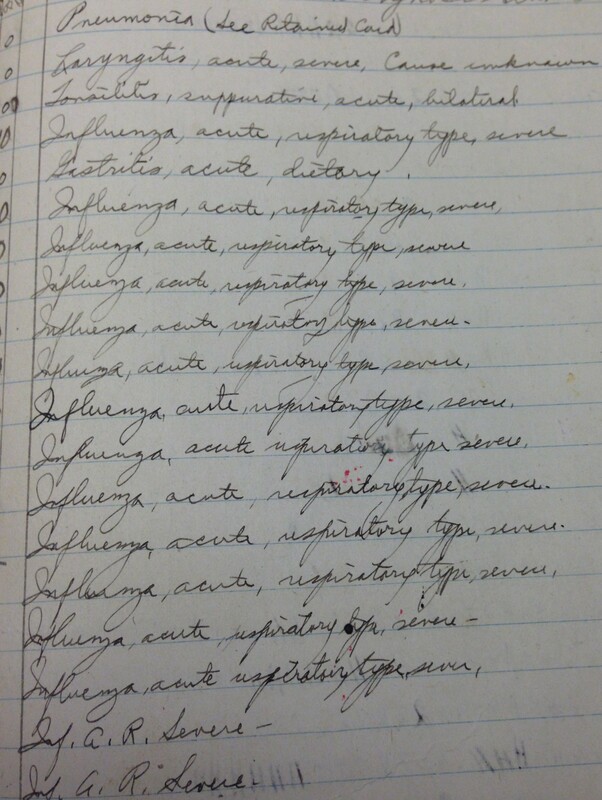 The epidemic was at its peak in Iowa the week of October 19th with a total of 21,117 cases, but the disease didn’t significantly disappear until the summer of 1919. By the time the outbreak ended in 1919, approximately 20 million people died the world over. This website on “The Great Pandemic,” as it is sometimes called, provides lots of information on the spread of the Spanish flu, including its effects in each state. The quarantine of which he wrote involved guards posted around campus 24 hours a day, 7 days a week. Anyone who wished to enter or leave campus required permission and were given passes to present to the guards, like the one below. The logic behind this was likely that all SATC members were men; therefore separating the men from the women would reduce the spread of the disease. It was a method that seems to have worked. Out of the 53 people that died at Iowa State, only two were women. The other 51 were all SATC men. The men’s names are included on the WWI list in Gold Star Hall in the Memorial Union. 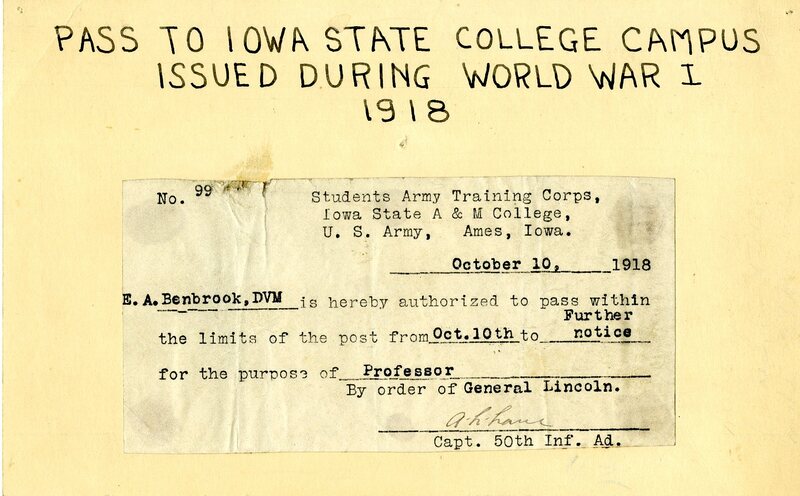 For more information on the Spanish influenza epidemic of 1918 at Iowa State, see the Department of Military Science Subject Files, the James Thomas Emmerson Papers, and the Charles F. Tous Papers. And of course, do what you can to prevent the flu and its spread this season – tips can be found here. Stay healthy! Last week, Kim had some fun arts and crafts project ideas from the archives to keep our hands busy while it snows. If I’m telling the truth, my favorite thing to do when it’s snowing is… watch the snow. 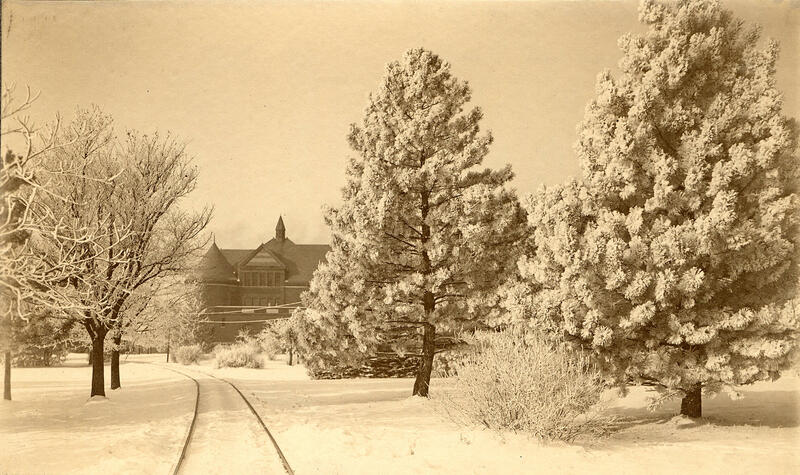 Since it’s not currently snowing, I’ll content myself with some photographs, like the one above of Morrill Hall dated around 1905. If I do have to go outside, though, good company is important. These women outside Lyon Hall in 1979 are making the most of their winter wonderland adventures – which most likely include class! Although we are a bit early, we’re celebrating World Audiovisual Heritage Day on the blog. One of the most notable features of the Special Collections and University Archives department is the number of films to which we provide access. Many were created by Iowa State or WOI and provide visual and sometimes sound-filled evidence of the days of yore. First, a video of landscape architecture professor Philip H. Elwood’s trip, with three students, from California to Ames in 1927. Below is the second of the two-part silent film. Even without sound, there is so much to take in. Not just the landscapes – which appear quite different than they do today – but the people, the clothes, the automobiles, other cues as to the time and place. Another film available through our YouTube channel comes from WOI’s “Expedition” series. This episode on Christian Peterson discusses his work and includes many of the sculptures that are still on display around ISU’s campus today. All three parts are available online; below is the first part. To browse more of our film collection – which covers agriculture, campus, social events, historical moments, and small towns around Iowa – check out our YouTube channel or our online film listings. Happy World Audiovisual Heritage Day from our corner of the University Library! 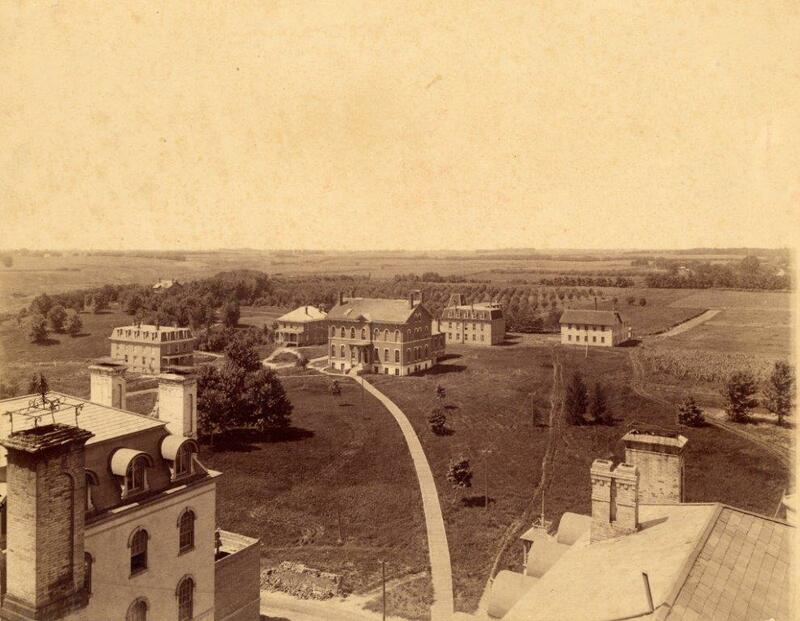 When Iowa State College (University) first opened its doors in 1869, military training was mandatory for all male students, based on the terms of the Morrill Act. Iowa was the first state in the country to accept the terms of the Morrill Act, under which the state would receive land to sell to raise funds for the establishment of a college of “agriculture and mechanic arts.” These schools included compulsory military training–but not for women. Group of women participating in military drill outside of Old Main, circa 1894. Carrie Chapman Catt was an early ISC student, attending from 1877 to 1880, who later became a prominent women’s suffragist and political activist. She was instrumental in the movement to establish women’s military drill on campus. Women’s voluntary drill began in 1879 and continued until 1897, and the women even joined the men as part of the Iowa delegation to the Chicago World’s Fair in 1893. More information about early military training can be found in the Department of Military Science Subject files (RS 13/16/1). See the Carrie Chapman Catt Papers (RS 21/7/3) and related items in the Digital Collections for more on this early Iowa suffragist. Last week, Whitney posted a picture of sheep in front of the Campanile. Today we’re taking a slightly higher perspective, and looking down from the Campanile itself. View looking northwest from the bell tower of the Campanile. Through the left window is visible the erection of Beardshear Hall with Marston Hall and Martson Water Tower in the background. Through the right window Morrill Hall can be seen. One of the carillon bells can be faintly seen at the bottom. Photo first appeared in the 1908 Bomb. Construction on Beardshear Hall, which can be seen through the window on the left, began in 1903, after fires burned down Old Main, which had originally occupied the spot. Construction was completely finished by 1908, although parts of the building had been occupied since 1906. The building was initially called the Central Building, but in 1938 it was renamed Beardshear Hall after President Beardshear, who presided over the proposal of its construction. The building initially provided space for multiple departments, including Mathematics, English, Botany, History, Modern Languages, Elocution, and offices for the President, Secretary and Treasurer, and Board of Trustees. More information on these and other campus buildings may be found in the Iowa State University Facilities Planning and Management Buildings and Grounds Records, RS 4/8/4. More photos of Beardshear Hall can be found on Flickr. When you look for photos of iconic campus buildings, what do you expect to see? The building in question, a lovely green lawn, maybe a sprinkling of trees, and… sheep? Probably not, unless you’re researching Iowa State’s sheep barns. The sheep grazing in the foreground of this photo with their shepherd and sheepdog add an interesting dimension to this image of the often photographed campanile – although, of course, all photos of the campanile are interesting. The campanile was built in 1899 in honor of prominent ISU alum Edgar Stanton’s beloved wife, Margaret MacDonald Stanton, who was Iowa State’s first dean of women and passed away in 1895. After Edgar Stanton’s death in 1920, 26 bells were added to the original 10 in his name. These became the instrument known today as the Edgar W. and Margaret MacDonald Stanton Memorial Carillon. As for the sheep, well, why exactly they’re on this part of campus is not known for certain. It’s possible that they’re out grazing to act as a sort of substitute lawn mower, but again, that’s speculation. Personally, I rather like that thought. More information on the campanile can be found in RS 4/8/4, this website devoted to the building’s 100th anniversary, the admissions website, and on the Sesquicentennial Celebration website. The photo above and others can be found on our Flickr site and in the digital collections. If you’re interested in sheep at Iowa State, you can find additional information on the old sheep barns in both RS 4/8/4 and the Sesquicentennial Celebration website as well. For those of you who have spent much time on campus in the last century, you probably wouldn’t recognize the subject of this photo without the caption, above. This is the Iowa State Campus looking from Old Main to the southwest corner of campus. Before it burned down, Old Main was situated where Beardshear Hall now sits. On today’s campus, this view would be like standing on top of Beardshear looking toward Campustown. Instead of a few buildings and lots of farmland, the view today consists of, well, lots of buildings. To see more photos of campus in the early days, check out our Flickr page or the Digital Collections website under “University Photographs”. Want to learn more about Old Main? We have a post all about it. For information about the history of our campus, we have a post about that too. Of course, if you want to see even more photos and learn all about central campus, stop by and see us!